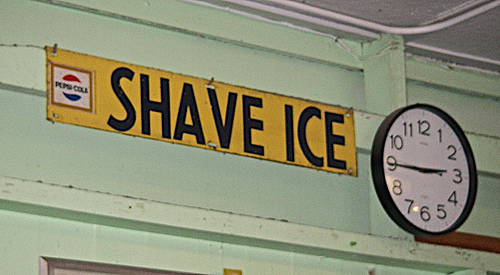 many people have the tendency to get confused on whether if shave ice is spelt or pronounced shave or shaved. the 'D' is dropped due to the hawaiian pidgin language that is utilized within the true hawaiian culture. don't get caught saying shaved!!! still confused? google some hawaiian shave ice companies located in hawaii and see for yourself! Hawaiian Pidgin has distinct pronunciation differences from standard American English. Th-stopping: 'O' and 'D' are pronounced as 'T' or 'D' respectively—that is, changed from a fricative to a plosive (stop). For instance, 'Think' becomes 'TINK', and that becomes 'dat'. L-vocalization: 'l 'is often pronounced with an 'o' or 'ol'. For instance, 'mental' is often pronounced 'mento'; 'people' is pronounced 'peepo'. Hawaiian Pidgin is non-rhotic. That is, r after a vowel is often omitted, similar to many dialects, such as Eastern New England, Australian English, and English English variants. For instance, 'car' is often pronounced 'cah', and 'letter' is pronounced 'letta'. Intrusive r is also used. The number of Hawaiian Pidgin speakers with rhotic English has also been increasing. Falling intonation is used at the end of questions. This feature appears to be from Hawaiian, and is shared with some other Oceanic languages, including Fijianand Samoan.